Millions of Windows users run outdated and insecure software, according to research (PDF) from antivirus vendor Avast. The company analyzed more than 163 million computers of which the majority (43%) was running Windows 7. From those Windows 7 users, 15% still used the RTM version of 2009 instead of the more secure Windows 7 SP1. Avast was able to compile the data because its antivirus software gathers information on the systems on which its installed. This allowed the antivirus vendor to analyze the applications users have installed on those systems. The most frequently installed application is Google Chrome (91%) followed by Adobe Acrobat Reader (61%), WinRAR (48%), Microsoft Office (45%) and Mozilla Firefox (42%). From the list, Avast specifically mentions Windows Live Essentials which was found on 16% of the systems. Windows Live Essentials is a software suite introduced in 2006 and Microsoft ended support in January 2017, which means the software no longer receives security updates. Even if users don’t use software, just having it installed can be a security risk. Avast therefore recommends to uninstall any unused and/or unsupported software. 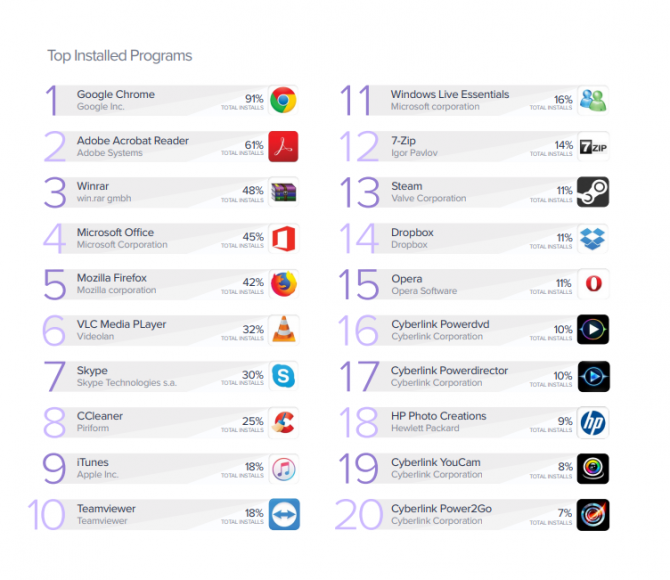 Avast also found that 55% of all installed applications need an update. Users especially don’t have the latest version installed of Adobe Shockwave, VLC Media Player, Skype and the Java run time. Also many Firefox and Thunderbird installations need an update. For some reason, users don’t update these applications even though they have an automatic update feature. Windows 7 is the most used operating system by Avast users, it’s installed on 43% of the computers. It’s closely followed by Windows 10 which is installed on 40% of the systems. Avast also analyzed the hardware from its users and found that the average PC is six years old. Half of the systems has 4GB of RAM and 85% of the systems doesn’t have a SSD but uses a traditional magnetic HDD.